Michelangelo’s painting on the ceiling of the Sistine Chapel, I can only imagine, is breathtaking to see in person. The pictures of it are jaw-dropping to say the least and it’s unbelievable to me that one man could have painted such an elaborate masterpiece! My pastor last Sunday used one panel from this painting in his sermon. The piece he used is the most well known of the panels, called Creation of Adam. I’m sure most of us recognize it, whether or not we can identify where it’s from or who painted it, but we’ve seen it before; used as an example of genius in the arts or as a comedic dig as a parody: Flying Spaghetti Monster, The Simpson’s. But on Sunday, what I saw on the screen was blatant truth. A blaring example of the relationship so many of us have with our Maker. God actively reaches out to us and it is clearly portrayed in that painting. You can see it in God’s demeanor. His upper body leaning toward Adam with determined eyes locked on His love; His creation. His right arm fully extended, desperately reaching. His hand open and with the last of His might, stretching His finger to touch that which He holds dear, with a despairing hunger for a response. And how do we respond? Adam portrays that effortlessly. Leaning back, comfortably resting on his own strength, Adam looks directly at God but waits for Him to come closer. His left arm is outstretched but not with his own strength. He rests it upon his knee, hand hanging limp, barely lifting his finger as an answer to the One who gave him everything. If any of you know me at all, you know that I don’t think there are any accidents, chances, luck, or coincidences in life. Everything is planned and orchestrated by God. He is very real and active in every moment of our day and can be seen clearly and often, but we choose not to look. 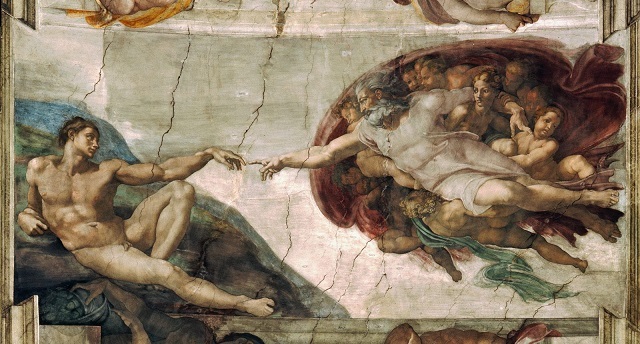 Michelangelo’s Creation of Adam appropriately portrays the heart of God and the heart of man. God actively seeks us and longs for a relationship with us, but our response is less than energetic. We pray only when things are going badly or we need something. Our schedules have become so hectic that if Sundays aren’t filled with activities, it’s the one day to rest, not go to church. We won’t read the Bible because it’s old and out-dated, “How could that book help me in today’s world?” we ask incredulously. The things we have we worked hard for and we deserve. We deserve more, we deserve better. If you look closely, the gap between God’s finger and Adam’s, although only a matter of a few centimeters, is an eternity and can be felt in each one of our lives if we aren’t actively seeking Him. But it takes effort, time, study and understanding. Don’t waste another moment to meet with Him. He waits for your touch.